If you've watched any of the Marvel Netflix shows, you've seen the work of Loren Weeks, who has been the Production Designer on all the first seasons, aside from PUNISHER. Here we discuss all aspects of his work on DAREDEVIL, some of the challenges and Mr. Weeks has shared some set pictures to go with the interview. Many thanks to him for this interview and I hope you all enjoy this look at the show. Kuljit Mithra: Nice to finally interview you! We've chatted in the past, I believe around the time season one of Daredevil came out. It's been a busy number of years for you, as Production Designer on the first seasons of DAREDEVIL, JESSICA JONES, LUKE CAGE, IRON FIST and DEFENDERS. It must seem like a blur now as you've moved on to other shows and projects. When you first took on these jobs for Marvel on Netflix, was it presented to you as a "package" so to speak, or did each showrunner bring you on based on the previous show's work? Loren Weeks: I was hired for DD S1 only. There was never any promise of doing more than that. It was certainly my wish to do all 5 series. By the end of DD S1 I felt I was solidly in with both Marvel and Netflix. Nonetheless I interviewed and made a pitch to the show runner, Melissa Rosenberg, for JJ S1. I did the same for each series after that. And when it came to The Defenders I had already worked with Marco Ramirez on DD S1 so he was already familiar with me and my work. Mithra: I have a general idea of what your "job description" entails, so I'll run this by you to see if I'm on the right track. You oversee the design of sets, props, graphics, setting the style guide for the show. Close? Weeks: Basically. The production designer is responsible for conceptualizing the physical (or non-physical) environments. That includes overseeing the set design (I design all my sets), set decorating, graphics, and props. We had a remarkable team for the Marvel shows. My art director, Toni Barton, my set decorators Alison Froling (DD, JJ, LC) and Stephanie Bowen (IF and Defenders), assistant decorator Marina Parker, Zach Zirlin graphic designer, assistant art director Jim Feng. And many many others. Mithra: I was wondering... do you also do architectural drawings of the sets? Weeks: Not me personally but a team of assistant art directors drafts the sets as directed by the PD and managed by the art director. A set is fully drafted in plan, elevations, sections, details, ceiling plans and any other drawing that might be required to convey the information. They are then passed on the construction, scenic and set decorating departments which use them to build the sets. There is a constant dialogue between these departments and the production designer, art director and set decorator. Mithra: In a sense, these Marvel shows are slightly different than other shows you may have worked on because there's some reference from the comics... but you really can't copy "Matt Murdock's apartment" verbatim. 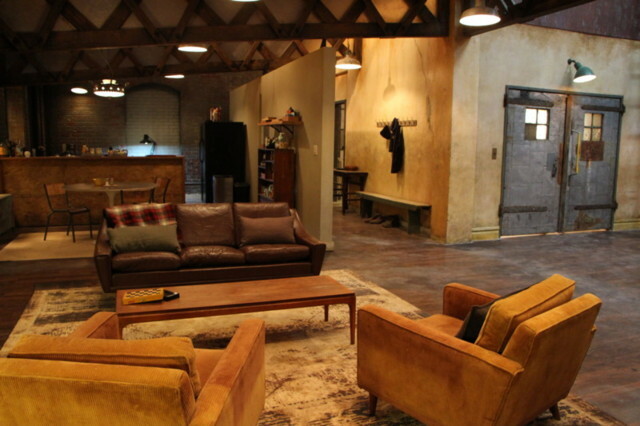 So let's start with how you designed the apartment... is that a set constructed specifically for the show? I'm sure you don't want to go into the minutia of it, but can you briefly go through what Steven DeKnight wanted, what you wanted, and what ultimately came to be? Weeks: I remember in the first concept meeting when we discussed Matt’s apartment. Steven said he wanted a converted industrial space and Joe Quesada said it had to be iconic. I think I swallowed my tongue. I pitched an attic space of an old manufacturing building. Massive wooden trusses started at 7 feet above the floor on the outer wall and pitched up towards the center of the loft space. The reason was to visually move your eye upwards to the center 2 story space. A stair led up to a roof exit and the space was crowned with multi colored glass clerestory windows. The intent was to suggest the clerestory windows of a church and the stair was to give purpose and create a journey to the roof, his journey from Matt to Daredevil. 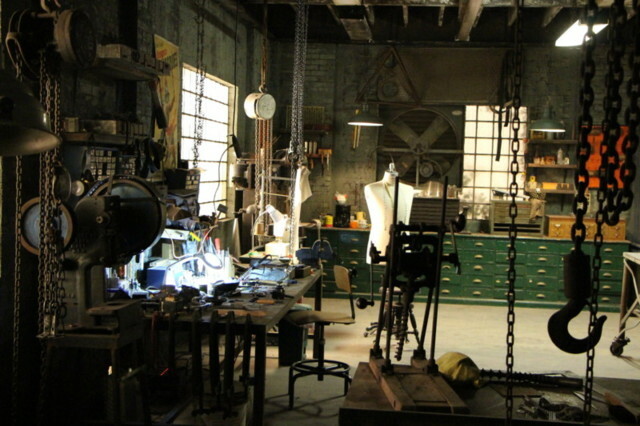 Mithra: Some of the other sets I wanted to ask about... namely Nelson and Murdock's office and Melvin Potter's workshop... one is very sparse, bright, the other packed with gadgets (which I'm guessing you had a hand in designing) and darker. Weeks: In that same presentation meeting Jeph Loeb remarked that I didn’t have any reference images for the law office in my presentation. I had a floor plan for it but no images. I had plenty of images for the loft but empty low rent offices...its not easy to find reference images. 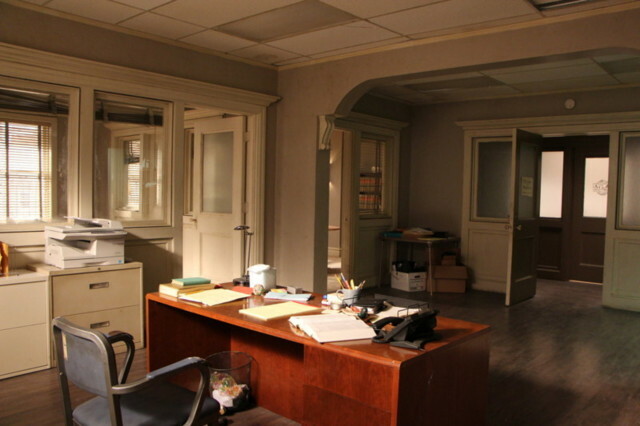 I told Jeph, and it was no lie, that I used the law office from his Daredevil: Yellow as my reference. He nodded and said that worked for him. Potter’s is one of my favorite sets. It took on a life of its own. We also had great fun in proposing Easter Eggs for it-all of which had to be approved by Marvel. Mithra: When you are using an existing location, like the real bar that houses "Josie's Bar", how much involvement do you have with setting those up? Weeks: I work with the location manager whose job it is to scout out possible locations, the director and the show runner. We discuss the look that the show runner is after, we may discuss other looks and eventually arrive at a creative direction. We then select from photos locations we’d like to see and then physically visit them. Its often a general consensus as to which ones we go with. The show runner typically has final say. Mithra: You've talked about many of the Easter eggs on the show sets... are there any that fans haven't noticed yet (you don't have to reveal them!)? Weeks: There may be. I don’t know if they’ve all been found. I think DD S1 is probably the most packed. Mithra: Are any of the other Marvel Netflix sets in the same location as DAREDEVIL, or are they spread out over several stages in NYC? Weeks: They are all pretty close together. The stages are shared between the series. One show wraps, the sets are folded into storage and another series follows right behind re-building established sets and building new ones. Mithra: Thanks for answering all my questions. Are you still involved with any of the new seasons of the various Marvel shows, or are you working on other projects? Thanks again. Weeks: After Defenders I needed a break. I started and overlapped each new series as I finished up the previous one. I was tired. Since Marvel I designed the 4th season of Mozart In The Jungle and a new show for Netflix called The Good Cop with Josh Robin and Tony Danza. I'm currently working on a period piece called ”Dickinson” for Apple streaming.